Steven Kasher Gallery is proud to mount an exhibition introducing the autochromes of the National Geographic Society Image Collection. From an archive of over 14,000 color plates made between 1907 and 1930, 65 have been selected as among the most fascinating, and as representative of the scope of the collection. They are being printed in limited editions for the first time. 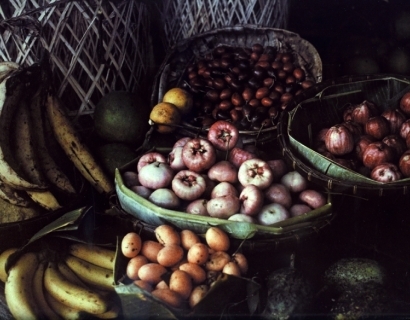 Autochromes: Early Color Masterpieces from National Geographic will run concurrently with 1.3: New Color Work by Joel Grey, an exhibition of cellular phone photographs by the award-winning actor and photographer Joel Grey. The two shows will juxtapose one of the newest forms of color photography with one of the earliest, and serve to highlight their surprising similarities and differences. As we are dizzied by new photographic media we can take solace in the pre-modern world of the earliest and maybe most beautiful, color photographs ever made. Autochromes are fragile glass plates: few in number, difficult to exhibit, largely forgotten in photo history. What they show us is a world before highways, before airlines. It is a world without plastic, without neon, without electronics. In 1895 the Lumiere brothers invented cinema. They immediately set to work on color photography. In 1904 they patented the autochrome (meaning “self-color”). In 1907, they began to mass-market these first practical, accurate color photographic plates, the first true color photographs. 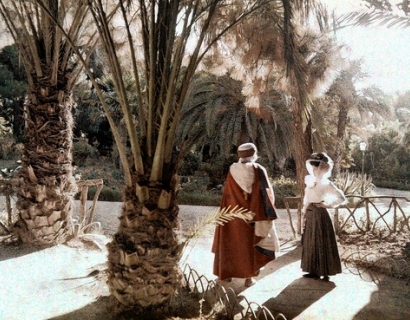 Autochrome plates were immediately adopted by the reigning art photographers of the era. Steiglitz, Steichen, Coburn, Kuhn, Struss, White, Eugene, de Meyer, Seeley, Haviland and Genthe sprang to the creation of autochromes. Steiglitz said, “Soon the world will be color-mad, and Lumiere will be responsible. The Lumieres have given the world a process which in history will rank with the startling and wonderful inventions of those two other Frenchmen, Daguerre and Niepce.” Coburn said, “It’s the greatest thing that ever happened to photography.” Over the next several years these Photo-Secessionists produced a small, luminous body of work in autochrome, seeking their Symbolist effects. In the first few years of the autochrome, thousands were shown in important exhibitions throughout Europe and America, and hundreds of articles were written about them in art and photography journals. Like the daguerreotype and tintype, the autochrome was not susceptible to manipulation. One simply made the exposure and developed the plate, which was a small unique object, impossible to enlarge, difficult to illuminate. It was quickly deemed too “mechanical” for serious artistic expression. The Secessionists abandoned the autochrome. But deficits for the artiste were ignored by a rank of professional autochromists who took the medium in a thoroughly modernist direction. They set out to document the world in color. They invented a realist vision to which art photography didn’t catch up until two decades later. These documentary autochromists worked primarily for two institutions, which today house the two most significant autochrome collections in the world. They are Albert Kahn’s Archives de la Planete in Paris and the National Geographic Society in Washington. The autochromes featured in this exhibition are printed from plates in the National Geographic Image Collection and are by Jacob J. Gayer, Gustav Huerlin, Hans Hildenbrand, Franklin Price Knott, W. Robert Moore, Pierre Manchard, Joseph Rock, Kiyoshi Sakamoto, Willard Culver, Charles Martin, Maynard Owen Williams, and Jules Gervais-Courtellemont. Gervais-Courtellemont is represented in this exhibition by over 25 prints. It is our belief that on the basis of the discovery of over 2,200 of his autochromes in the Image Collection, many of them inspired and haunting, Courtellemont will go down in future history books as the first great color photographer. Autochromes: Early Color Masterpieces from National Geographic will be on view May 27 to July 10, 2010. Steven Kasher Gallery is located at 521 W. 23rd St., New York, NY 10011. Gallery hours are Tuesday through Saturday, 11 to 6 pm. For more information or press requests please contact Kirsten Bengtson at 212 966 3978,kirsten@stevenkasher.com.